HAVING BEEN INVITED TO STERLING ESTATES FOR THEIR "HAPPY HOUR" AND SOMETIMES ASKED TO STAY FOR DINNER, I AM NOW LOOKING FORWARD TO JOINING THEM BECAUSE OF THE THOUGHTFULNESS OF THE WORKING PERSONNEL AND THE FRIENDLY ATMOSPHERE. Sterling Estates is lovely. That’s where I would go in a heartbeat, but it's expensive. My husband needs special care, and that runs the fee up. It’s very nice and fairly new. Everything is clean and updated. The people are very friendly. They had an open house with a lot of people and had refreshments and nice tour. The community is very nicely landscaped with flowers and green grass. My father-in-law is at Sterling now. He has some mutual friends there. They allow small pets. The room that he got there is very comparable in size with the one from the other facility. It was a little bit of a different layout, but large enough for him to have a sofa, a recliner, and a little TV area, which is important to him. They have a pool, something the other facility did not have. He has enjoyed that. There are some exercises in the water and even just walking around in the pool. There is also some camaraderie at the pool -- people talking to each other -- and they have organized activities there as well. They have on-site physical therapy. My mom moved to sterling estates 2 years ago. From the moment she moved in there my sisters and I knew this was an excellent home for Mom. The staff is professional, the place is beautiful. Everyone is treated like family. Seniors have as much independence as want with the opportunity for assistance at a moments notice. My sisters and I have great peace of mind knowing mom is living at sterling! Having lived in East Cobb for 36 years, and as a Realtor, it is great to have this superb community available to offer to older clients. Many like the idea of downsizing and yet, want to be able to have full service ammenities and an active lifestyle. Sterling Estates provides the perfect option for older Parents for example, who want to live close to their grown children yet have their own "home". This family-friendly neighborhood, encourages wellness and exercise and being as active as you are able to be. I have a former client who lives there now and she just loves it. Her circle of friends there and support system made her feel welcome immediately. I have eaten there a number of times and tableside service with delicious choices, always provided. We are lucky to have this Senior Living community here in East Cobb. Ed R.
MY WIFE AND I HAVE BEEN RESIDENTS OF STERLING ESTATES FOR ABOUT TWO YEARS. WE LIVE IN ONE OF THEIR NEW AND WELL MAINTAINED COTTAGES' IT IS LIKE LIVING IN YOUR OLD HOME, WITH PLENTY OF SPACE, SECURITY,AND ALL THE CONVENIECES THAT GO WITH AN OUT- STANDING SENIOR LIVING FACILITY. HOWEVER, WE GO DOWN TO THE MAIN BUILDING FOR MIND GAMES, SWIMMING,AND EXERCISE CLASSES. WE EAT LUNCH AND DINNER,WHICH IS HEALTHY AND VARIABLE, MOST WEEK DAYS IN THE MAIN BUILDING. ON FRIDAY, SATURDAY, AND SUNDAY, WE EAT OUT OR COOK IN. TO GO OUT IS VERY EASY, SINCE THERE ARE MANY AND VARIOUS EATING ESTABLISHMENTS AS WELL AS STORES IN THE IMMEDIATE AREA. THE STAFF IS OUTSTANDING,COURTEOUS, HELPFULL AND CARING OF THE NEEDS OF ALL THOSE RESIDING AT STERLING. I WOULD LIKE TO INFORM ONE AND ALLTHAT YOU DONT HAVE TO BE IN YOUR NINETIES OR FEEBLE TO TAKE ADVANTAGE OF ALL THE PLUSES THAT STERLING HAS TO OFFER. REMEMBER YOU ARE NOT GETTING ANY YOUNGER!!!! My thoughts on The Sterling Estates Marietta, Georgia FACILITY The architecture of this new residence has the feel and appearance of a grand home. The public areas are decorated and furnished just like home.. The terrace and porches Provide a comfortable place to sun and view the wonderful landscaping. The wellness Center (gym and pool) and activities center are first class. There are apartment accommodations to satisfy one’s different needs. ACTIVITES The activities really keep us going, from bingo, brain games, arts and crafts to restaurant outings and shopping trips. The wellness program offers us group exercise programs in the gym and the pool as well as individual sessions. STAFF The companion care givers are a great help to me and all others. Each companion knows every resident by name and is familiar with their individual needs.. They are cheerful and warm. Their quality of care is the hallmark of this residence. The management staff works very hard to keep us all alive and living. Their many programs keep us active and moving. They know the way to ones heart is through their stomach so they set a fine table. Having never lived in a senior community before my wife and I were surprised at the genuine level of attention that comes from the staff here. The staff is very nice at Sterling Estates. A lady, I think named Sharon, is the director and is very good. I had lunch there. My daughter also lives right near there, which is a good thing. It's all nice, and the facilities are good. They had swimming pool and activities like dancing and movies. It's new, it's fresh, it's good as new, and it's good looking. Sterling Estates has been a God send. My mom who is 91 fell in January and broke her hip. After surgery and rehab, mom was not able to return home. I looked at all of the senior facilities in East Cobb and new immediately Sterling Estates was the right fit. Other facilities had no formal exercise room nor heated swimming pool much less a dedicated staff member who CARES about every resident's health and encourages them to exercise. My mom hadn't been in a swimsuit since she was 20 years old. Now she's in the pool twice a week and getting stronger from week to week. From the kitchen staff who always prepare delicious food and offer variety to their menu to the nursing staff and care givers to the management team and owners, Sterling Estates offers the best senior care in East Cobb. Mom is in a safe loving environment with lots of good friends. They have become her second family! Thank you, Sterling Estates for the peace of mind you have given me! owner operated, caring professional staff. My father is 100 and went into Sterling with a broken hip. In 6 months he barely need a walker. Need I say more. My husband and I were now in our 80s. We were starting to see signs that our bodies and minds were getting up in years. Mat fell out of bed, thankfully not damaging his pacemaker. I also had a fall. It was becoming apparent that we needed more help to get by. I visited a local Assisted Living facility and was very depressed by what I saw. People sat staring out the window and the place smelled very bad. This was not the dream I had for my, "golden years." Fortunately, I had an office visit with a physical therapist and she told me about a new senior residence which was under construction in Marietta. I was curious enough to go and take a look. Even though the property was just being developed, a strong feeling came over me that, "this is it." I had not had such a feeling since decades earlier when I had the urge to open my own sandwich shop. The idea of a place dedicated to wellness was just what I wanted to see. Having a heated indoor swimming pool, plus healthy meals, in a beautiful environment, were my hopes for a better future. I met Sharon and Marshall at Sterling Estates and was very pleased with their friendliness and courtesy. I knew that the biggest challenge I faced was to get my husband convinced it was time for us to move. Since he liked the buffalo burgers at Ted's Montana Grill, I suggested that we go for a ride. While we were there, I casually suggested that, “just for fun,” we go take a look at a new retirement place down the street. He was equally impressed. I told him that I was concerned if we could afford something that nice. He told me that since we had been paying into a long-term disability fund for many years, we could. We decided that the least we could do was give it a short-term trial and see if it was a good fit. We moved in August of 2012. It was wonderful to be in a community of caring people who showed deep personal concern for all of our needs. This became especially important as my husband’s health deteriorated. We do not know how we would have managed without a team of experts to help us through the difficult time of concluding his life. I am so blessed today to enjoy the luxury and comfort of pristine surroundings, including a flower-filled courtyard, complete with a fountain and rubber ducks! Additionally, after many years of hoping and wishing, I have finally found a close personal friend with whom I can share activities. Our only regret about Sterling Estates is that we could not have moved here sooner. Since we were some of the first residents to arrive, we have had the benefit of enjoying this wonderful place as much as possible. We visited a large number of communities before deciding to place my dad at Sterling Estates. The people and the facility are far above anything else in the East Cobb area. From our first visit, the staff their demonstrated that they valued my dad - and all of us - as members of a community that they are serious about making a welcoming, safe place. Sterling Estates of East Cobb had a swimming pool, three meals a day served, and maid service once a week. It was a very nice place. The thing we did not like about it was that it did not have a full kitchen, but the food was delicious. They're very caring. The rooms were small. The lady who conducted the tour was very efficient in showing us around and answered our questions, which we really appreciated. Sterling Estates of East Cobb was smaller and on a 10-acre campus. We liked the independent living. The facilities were gorgeous and very nice, and the people were very nice. The residents all looked pretty happy. My Wife and I are 35 year residents of East Cobb. Having been a residential Realtor in the Atlanta area for 11 years, I have a number of older clients and friends who are our Parent's age. A number of these clients/friends have wanted to downsize but yet want the security of an active adult community. The staff and environment at Sterling Estates is just amazing! They focus on being as active as you can be. With a strong emphasis on wellness, this family-friendly environment, provides a beautiful setting, delicious meals and state of the art ammenities. There are always lots of activities going on there. I would doubt there is anything else in the state of Georgia, perhaps the Southeast which can touch this stellar place. Having had a Grandmother in an older adult setting in South Carolina, Sterling Estates is in the forefront of any such communities I have ever visited. A former client is a resident here now and has been for over a year now. It's great to visit the folks here as they are always upbeat, anxious to help and clearly welcome visitors. We are so fortunate to have this community in our area as Parents age and want to live near their children yet have their own home. Sterling Estates is just a perfect spot for those situations. 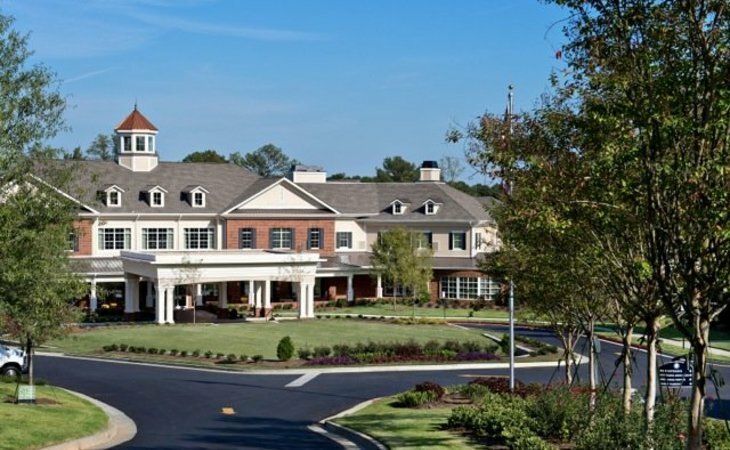 Sterling Estates Senior Living Community is East Cobb's / Marietta's newest Assisted and Independent Living Community situated on 10 acres located on Lower Roswell Rd just off of Johnson Ferry Road. We have 90 private suites with a choice of nine floor plans from studios to 2 bedroom/2 bath suites in the main assisted living residence. Surrounding the main residence are 6 custom-built duplex cottage homes with three different floor plans ranging from 2,000 to 2,400 square ft. In partnership with you and your loved ones our commitment is to encourage and empower each resident to stay active and independent by focusing on wellness activities that promote physical and mental stimulation so that each resident's lifestyle and well being is enhanced. Sterling Estates was designed, developed and is managed by four local partners with over 75 years of combined senior living experience. Sterling Estates was built with their own families and friends in mind. No other senior community can compare to the lifestyle, features, amenities and outstanding value that Sterling Estates offers each resident. We invite you to come and experience the Sterling Way. What should caregivers and potential residents know about Sterling Estates of East Cobb?